I was scouting about for another picture in my photo scavenger hunt challenge, when I walked past the old Chicken Deli now re-named People's Chicken. 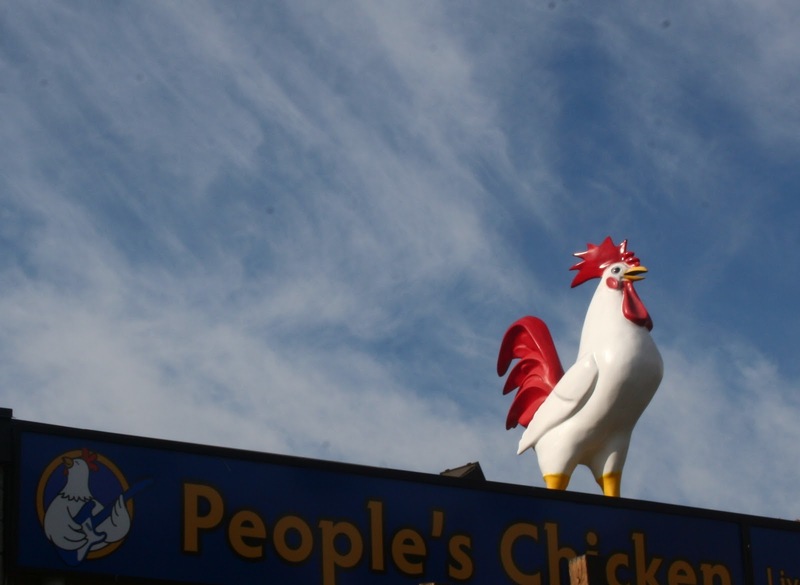 Well about a year ago Chicken Deli closed for renovations and opened up as People's Chicken. In my opinion a lot was lost in the name change. I started calling it the People's Republic of Chicken. I don't know; maybe I just don't like change. The place is still busy. 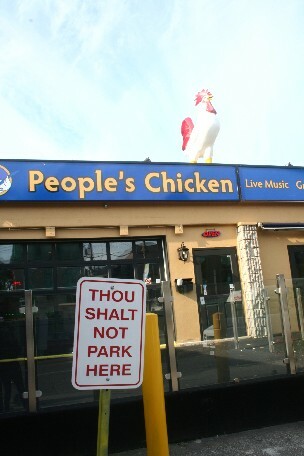 The chef of the old Chicken Deli is part owner. They kept the rooster....what's not to love. I like to compare this name change to naming a yarn store. I think that you can call a yarn store "Yarn Deli" or "Fibre Deli"; but I'm not sure that you could name a yarn store People's Yarn or People's Fibre. I know, if it's your store, you can name it anything you want. But you would want that name to convey the feeling that you have a wonderful selection of gourmet yarns at great prices and offer very personalized service? Something to think about. Just as an aside, I would also not have chosen the "church" no parking signs. Something more in keeping with theme, would be better, such as, No Roosting or This Coop is Reserved - that's if humour is your intent or just keep it simple with "no parking." I am still undecided as to whether I will submit this photo as an example of the item, "sign" on the list. I will keep my mouth shut about aperture and shutter speed - not giving me a clear image of the rooster. Here is a better photo, if not a little truncated. And by the way, the sky is not falling. Great story, Carol. I like your ideas for the no parking signs too. Change isn't always good.